Are you a fast growing business and still relying on excel reports & multiple systems to manage your day to day challenges? Well, it’s time for you to move on. Run your growing business on the most trusted, secure and complete ERP system in the world. 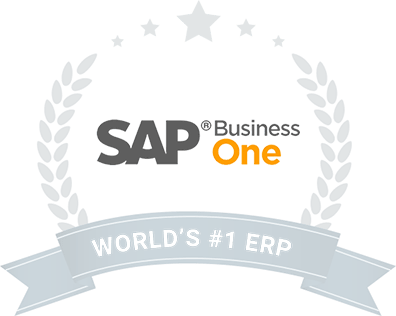 Tens of thousands of small and medium enterprises across the globe manage their businesses worth billions of dollars on SAP Business One. So trust us, you’re in good hands! Need a solution that caters to all your business needs from finance to operations and supply chain to retail? Don’t worry we’ve got you covered! SAP Business One offers a comprehensive one-stop solution that gives visibility to your entire business. Operate at the gold standard from day one with best-in-class SAP B1 implementation In India. Get what you need in one easy-to-use, integrated solution. Expand seamlessly as your business grows in size, complexity, and revenue with an ERP system that’s scalable with local language, currency, and compliance requirements. Make informed decisions on-the-go to accelerate sales and profitability with real-time data analytics. Achieve success faster like never before. Let our consultants discuss your key requirements and help you capture new business opportunities with SAP Business One. Uneecops is a brand that inspires trust and admiration amongst the industry leaders. Uneecops offers a wide array of industry-specific SAP Business One solutions carefully designed to integrate with industry requirements, your company’s processes and best practices. The software is helping Indian Pharmaceutical firms to improve the speed of decision making, automate complex Batch Manufacturing Records (BMR) and manage the quality process from purchase goods receipt to customer delivery. The software helps you to manage the complexities of the supply chain from forecasting item location demand through material procurement. The solution also helps in shelf life management, production & packing planning. and crate management. The solution helps the electronics industry to track variants items and versions, improve quality control across the supply chain, helps in advance planning, scheduling and auto-batch management. The SAP Business One solution helps to manage the City Gas Distribution process right from the procurement of materials, construction to management of pipeline laying, daily gas compression detail and product maintenance. This solution records multiple locations, handles scheduling and inventory of vehicle types and categories. It also suggests alternative routes to reduce delivery time. SAP Business One software helps you to manage all your products and packaging needs, and manage a substantial amount of inventory. The software also gives you key insights on daily production, consumption, batch costing and day-wise pending sales order reports. The solution ensures compliance and end-to-end traceability of milk and milk products across the entire supply chain. With this software, it is easier to calculate rates based on quality and quantity, handle order processing, and track activities from procurement to delivery of milk. The smart and intelligent ERP helps in project planning, project tracking, project cash flow, design tracking and abstract (running billing). With this ERP, it also becomes easy to categorize the type of works (service & materials). This solution integrates seamlessly with various processes of inventory, purchase, sales and distribution. It tracks and manages every step with precision and eliminates manual errors. The software helps in sales and inventory management, production and operation process, shop floor scheduling, quality management and product costing. It also offers complete visibility from request-for-quote to order fulfillment. Improve supply chain management with a single and centralized system from production, sales and shipping to purchasing, goods receipt, warehouse management and communication management. The solution helps to streamline your financial operation, from daily accounting tasks to banking and financial reporting and analysis. It also helps you to manage the complete order-to-pay cycle, including receipts, invoices, and returns. The solution takes care of complete leasing and renewal promotions, events and signage management. The system also helps in billing management, security management and electricity management. The system helps in fleet management, time management, chauffeur management and helps to manage leads from multiple sources, The software helps companies to avoid any backlogs, and optimize fleet availability and utilization for maximum profitability. Effortlessly manage a complete repository of cricket and other sports items such as football, baseball, rugby, ice hockey and other sports kits through item master in SAP Business One. The software helps you to plan a complex packaging process, and meet the desired quality benchmarks. Reimagine student engagement and learning models through educational ERP. With this ERP, forget about the hassle of maintaining heaps of paperwork and effortlessly manage time, admission, recruitment, grades and exam operations with SAP Business One. Track everything you keep in stock, precious stone, raw gold bar, ornaments and consigned goods with SAP Business One. Accurately estimate costing, view sales slip, customer order slip, sales delivery, manage approvals and alerts with SAP Business One. Get actionable dashboard of your stores’ sales, orders, and other data such as how much revenue you are making on each product cycle with SAP Business One. Keep a track of shift scheduling, time clocks and a host of retail operation activities with this ERP. Give your business a true competitive edge with SAP B1 "Add-ons" products that are designed to meet your business needs. Our add-ons help companies improve their business functions like production, distribution, service, project management and retail etc. inside SAP Business One. Anubha Gupta Director of Gopal Corps Ltd. details as how with SAP Business One the company has attained more precision and all business functions are now integrated and streamlined. Watch the video to know more. Watch the CEO of Orbit Techsol talk about how Uneecops helped them migrate from tally to SAP Business One and resolved reporting, vendor and inventory management challenges. "More precision. More integrated processes. We have benefited immensely from SAP Business One implementation." "Uneecops has resolved our reporting, vendor and inventory management challenges with SAP Business One." "Our company has attained more precision and all business functions are now streamlined." "SAP Business One has come as a blessing in disguise as it has solved our data management issues and helped in making critical decisions on the fly."